Greater Campbellsville United recognized several outstanding African Americans in February in honor of National Black History Month. 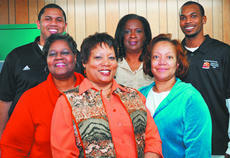 Each recipient works in the field of education, either as an instructor or as a paraprofessional. It is the policy of the Central Kentucky News-Journal to publish public records as they are reported by various agencies. Names appearing in "On the Record" are published without exception, to preserve the fairness and impartiality of the CKNJ and as a news service to our readers. David A. Hughes, speeding, amended to improper equipment, $158. Erik R. McCrady, speeding, $193. Parrish W. Keller, one headlight, dismissed. Marco V. Mitchell, failure to wear seat belts, defendant stipulated probable cause, dismissed. Starting right out of high school because a neck injury prevented a college career, Curtis Cotton has been coaching football nearly half (17) of his 35 years. 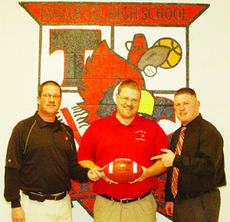 On Friday afternoon, Taylor County High School hired Cotton as the Cardinals’ eighth head coach. TCHS principal Charles Higdon Jr. recommended Cotton to the site-based council and Taylor County superintendent Roger Cook. It is the policy of the Central Kentucky News-Journal to publish public records as they are reported by various agencies. Names appearing in "Circuit Court Action" are published without exception, to preserve the fairness and impartiality of the CKNJ and as a news service to our readers. Campbellsville University students are continuing to gain servant leadership experience through a variety events and activities, and five students from the Campbellsville University School of Theology recently attended three days of the Festival of Young Preachers in Louisville. Campbellsville students not only attended the event but also raised the bar by bringing the largest group. Taylor County’s Lady Cardinals never overcame a 16-6 start and were eliminated by Adair County 58-49 in a 20th District Tournament first-round game at Campbellsville. Junior McKenzie Martin hit a pair of lay-ups in the first 90 seconds to put the Lady Indians (17-10) in front to stay, and Chelsea Beard tallied 11 first-half points as ACHS’ lead grew to 21 (34-13) after another Martin hoop. Rachel Riggs’ follow and two Hope Wigginton free throws around a Whitney Rodgers’ lay-up cut TCHS’ deficit to 19 (36-17) at the intermission. Your New Hangout and More has opened at 205 S. Central Ave. across from P.C. Clark. Your New Hangout and More features pool tables, air hockey and arcade games. Snacks and drinks are available and owner/operator Jennifer Downs also sells Mia Bella Candles and Herbalife. Downs welcomes everyone to come hang out at Your New Hangout and More. The business is open daily. Call 465-4673 for more information. A total of $1,741 was collected through the efforts of Taylor Regional Hospital and its team member activities committee for the American Red Cross Haiti relief effort. 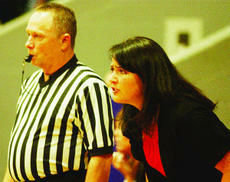 Pictured are, from left, Shelia Wade, Mandy Sprowles, Linda Marcum and Shelly Ford. Friday, March 5 is World Day of Prayer 2010. Women, men and children in more than 170 countries and regions will join in this annual celebration. This year's theme is "Let everything that has breath praise God." The program is written by the women of Camaroon. A special service will be at 7 p.m. at Liberty Cumberland Presbyterian Church, which is on Old Columbia Road, about five miles from Campbellsville. Members of all churches are invited. It is the policy of the Central Kentucky News-Journal to publish public records as they are reported by various agencies. Names appearing in "Property Transfers" are published without exception, to preserve the fairness and impartiality of the CKNJ and as a news service to our readers. The amount listed is the price paid or the fair market value of the property. Howard T. and Alice Martin of Sheridan Drive in Campbellsville to Linda L. Rainwater of Sheridan Drive in Campbellsville, a tract of land in Green Acres Subdivision, $1,500.